NOTICE: As of update Rampaging Koala, ores no longer spawn in physics-affected blocks. This guide is no longer applicable. 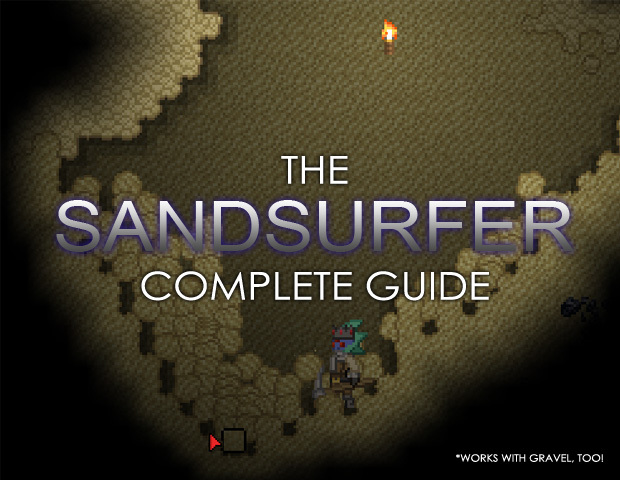 Welcome to my SandSurfer guide. The way is not just productive, but also lots of fun. With just one go you could get many ores. Made all this within 15-20 minutes and one go. Note: You can't find gold ores over fine sand, Until reaching Gamma sector. You will die, probably, at some point. You got to have many resources in order to climb home with this method. Make sure you're on a planet that matches your defense. If you have a high amount of Pixels consider buying stuff from merchants before going. Travel to some desert-biome planet at threat level that fits you. Once you finished building a home you can start exploring. Go left or right until you'll find fine sand (not sandstone, and not just sand). Try using your pickaxe and make sure it's really fine sand (it's supposed to immediately break and crumble). Start digging. Go as deep as the fine sand leads you. At some point you'll notice some fine sand crumbling aside you. Reach to a solid land and then, hop in the fine sand, aim your pickaxe down-left or down-right. If there's enough fine sand you'll see that you're progressing quick in it, kinda like surfing. Enjoy the activity and the good that comes with it. Take wooden log, which is a good torches source. If you see a group of ores, aim below them and they'll crumble. Take bandages, maybe it won't save you but you'll last longer. You could avoid fighting by crumbling a monster down. Gravel acts just like fine sand does. Remember to trash the stacking Fine Sand and Gravel from your inventory. CURRENT VERSION: there is a glitch in the game, sometimes when you break rear blocks (Right-click) you can teleport back to your spaceship, it's a good way to get back home alive. Go, have some fun. I hope you enjoyed the guide. Please let me know if there is anything to change. More to come: Im working on a video demonstrating the method well. This page was last modified on 20 October 2016, at 02:48.